About Nicklaus and Watson - The Battle a Turnberry: The British Open, or the Open Championship as it's known outside the United States, is believed to be the most challenging tournament in professional golf. There was no greater Open than in 1977 at Turnberry on Scotland's southwest coast, when Tom Watson and Jack Nicklaus battled over the last thirty-six holes with Watson winning with a closing birdie. 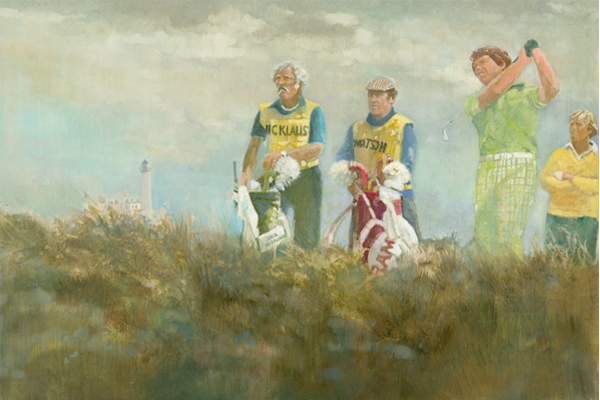 Why was 1977 British Open considered so special? Well, consider the leaderboard: Eight of the top nine players went on to be named to the World Golf Hall of Fame. Names like Watson, Nicklaus, Lee Trevino, Ben Crenshaw, Hubert Green, Paymond Floyd, Johnny Miler and Arnold Palmer showed up on the leaderboard, very late in his career. All those great names were in the Top 9.